We're officially into the first weekend of November. Can you believe it? Now the craze of the holidays can officially begin. Coffee joints (*cough* Starbucks) have their holiday cups out, people are talking about their travel plans and lists for gifts are being checked. I'm never truly ready for the holidays. I just go with the flow as best as I can. This faux fur collar from H&M is one of those items that reminds me of holiday shopping with my mom when I was a kid. I have vivid memories of walking the downtown streets with her as we shopped. She would never call herself a fashionista but she had such amazing things - one item being a fur trim jacket. I loved holding her hand when she wore it since the material was so soft. Now that I'm all grown up, I'll settle for my faux fur. man i want that faux fur collar so bad. it's so awesome. and that blazer. and that bag. i love this outfit a little too much. This has to be one of my favorite outfits ever of yours! So so pretty! great look. 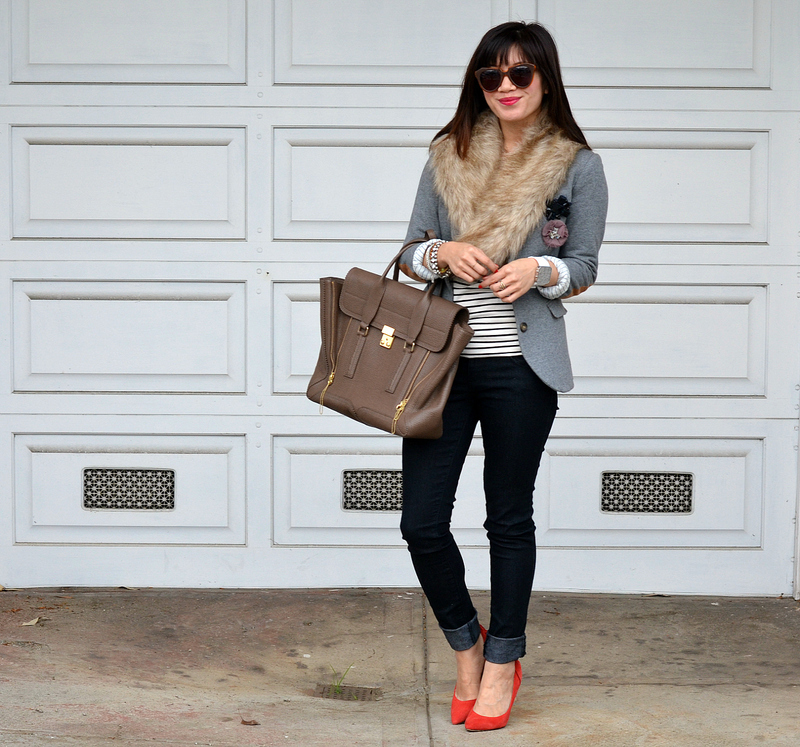 the blazer, faux fur, and pop of red in your heels!!! also, who doesn't love a good brooch x2! Gorgeous!!! Love it all! That faux fur is amazing, and i love your styling! nancy, i love your blog post title for today! so awesome and so is this outfit girl. isn't it something the things we pick up from our moms and such? i love everything about this outfit! really cute jacket, great jeans and i love your heels. nice add of color! LOVE the look of fur. It's a winter staple for me. I love the addition of the fur collar – totally mixes things up. Crazy how Halloween passes and the holidays are everywhere! I love that collar! So classy! "I just go with the flow as best as I can." That's exactly how I feel! Holidays are fun, but they are tiring! great outfit, i absolutely love it! I love the bright color of your heels and YES the faux fur stole! I love anything with a fur collar/trim and this look is so luxurious! this is look is perfect in so many ways. i mean the stole, the heels, bag! ahhh! lurve the faux fur stole! And those heeeeels, lady! omg! !looking stylish&gorgeous!love your style so muuuuuch! OMG - I've been looking for a fur collar! LOVE yours! I am in love with your outfit!! Perfect for fall! I love how you added the red pumps. Liking the grey jacket and pins. I agree with you on the faux fur. I've seen lots of great looking real fur in the vintage and thrift stores lately but I still can't wear it. Faux all the way. Haha... FAUX real... I love it!!! Your outfit is amazing, by the way! Super cute! I LOVE the holidays and I LOVE your fur stole! I'm obsessed with the color of your phillip lim! 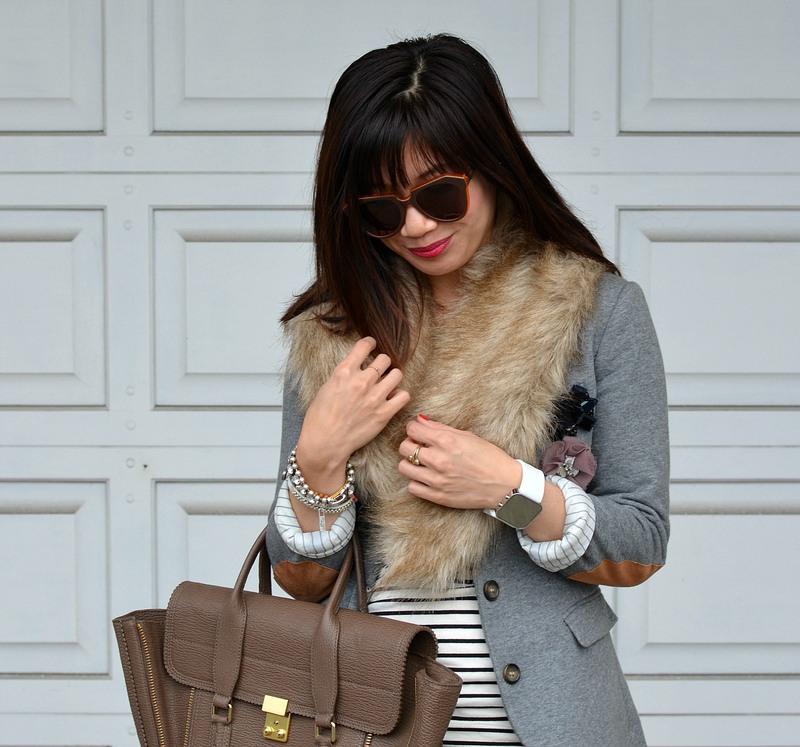 I love how the fur adds a glamourous touch to the otherwise classic, preppy look! The memory you paint of your mother is so beautiful. Now can I please steal that fur stole of yours. I love everything about this outfit! The shoes are such a great pop of color! OH my gosh, love this outfit, the stripped shirt and the blazer with that fur collar, too cute! Love that show color as well! Love the fur collar...definitely a trend for Fall. And the elbow patches! I want a blazer with patches so badly for some reason. Stop it. The fur and those pumps - too classy! The amazing bag adds for the perfect outfit! Love that fur collar, and of course, the pashli!! love the red heels! soo cute! your outfit is fabulous. And I just adore you telling us about shopping with your Mom. Awesome. Love this look so much. What a gorgeous look! The pieces are all classics, but the details elevate it to a whole other level - the red heels, the elbow patches and flowers on your blazer, the fur collar... Love it! You're an absolute dollface, love this outfit! November has definitely crept up on me, I have a feeling I might fall behind on holiday shopping this year (not that I'm ever ready, either). The faux collar looks so warm, I could definitely use that today! Such a cute outfit, I love your faux fur piece--was just thinking how I wanted to wear my faux fur collar, if only it were cold enough here! I am so in love with this outfit! I would wear it from head to toe. I have that same faux fur collar, plus in a darker brown and black. I wear it all the time in the winter! I love this! everything about this look is so classic. Love this outfit! Your soo stylish! Thanks for leaving a comment on my blog.. I am now following you.. I hope you'll follow me back!